The modulation transfer function (MTF) provides vital information about the imaging performance of an optical system. 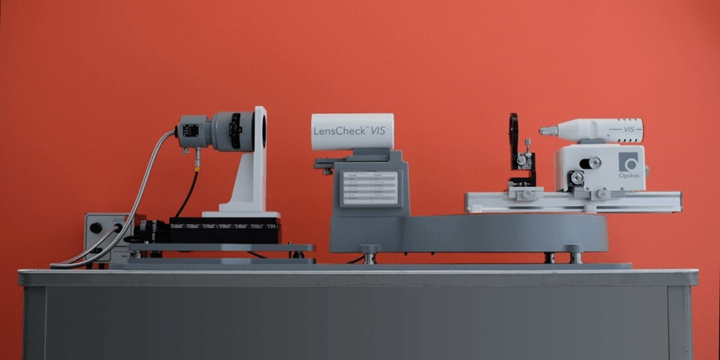 Measuring the MTF of a lens or lens assembly is a reliable way to assess lens quality and is used across multiple industries, including defense, automotive, and medical devices. To collect reliable and accurate MTF data, proper control of all imaging parameters is required. One parameter of common interest is conjugation, or object distance. Most imaging systems are designed to work for a specific object conjugate distance. 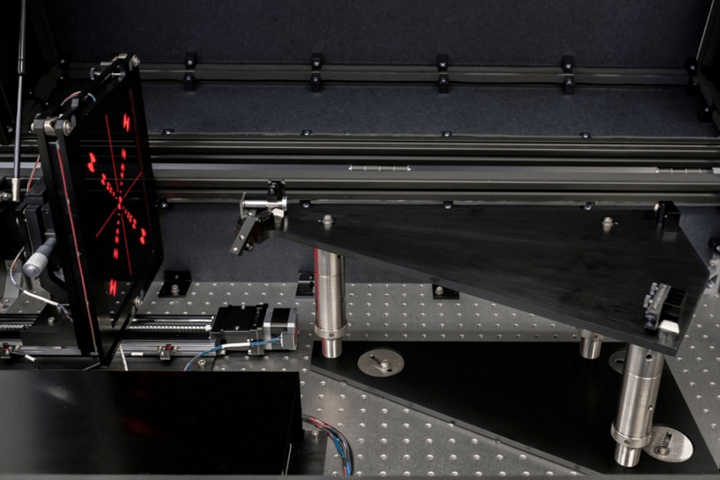 Measurement of an optical system at incorrect conjugates can produce misleading results, which can lead to incorrect conclusions about system performance and wasted engineering and development time. Testing an infinite conjugate optic with a finite conjugate target. Simulating an infinitely distance object can be practically difficult. Often, the assumption is made that an infinite object can be approximated by a finite, but relatively large object distance; for example, the hyper-focal distance of the system under test, or an object distance 100 times the effective focal length of system under test. These finite distances can easily be shown to provide misleading data. Testing a finite conjugate optic with an infinite conjugate target. Configuring a system to measure MTF at a finite conjugate involves other practical difficulties, such as challenging alignment procedures and limited system flexibility. It can be tempting to test a finite conjugate optic using an existing system with an infinite conjugate source. However, this will again produce misleading data. To demonstrate the impact of these errors, scenarios (a) and (b) were modeled in ray-trace software and the predicted MTF was compared at two conjugate distances. 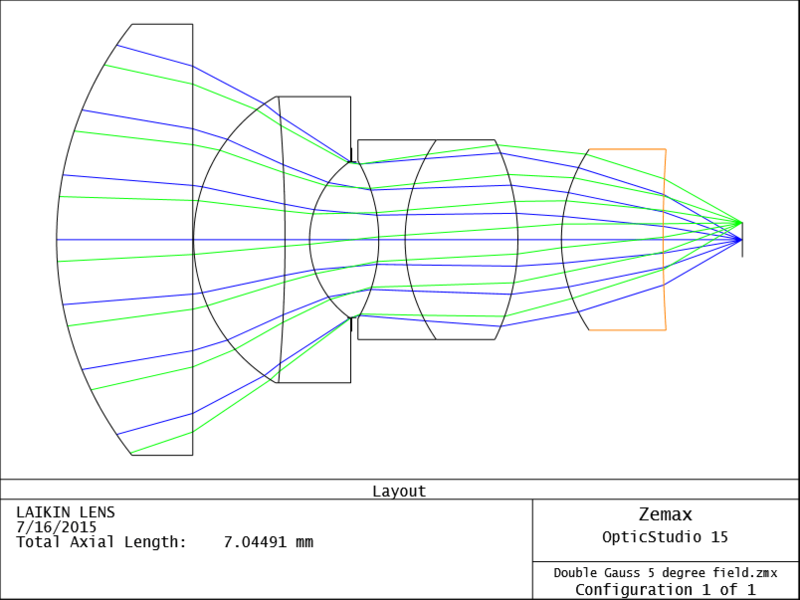 For scenario (a), analyses were performed using a Zemax sample lens file consisting of a 5° Double Gauss lens (Figure 1). This is an f/1 lens with an effective focal length (EFL) of 4 mm. The MTF was evaluated on-axis and at an object angle of 2.5°. Figure 2 shows the MTF of the Double Gauss lens on-axis for an infinite object and an object 400 mm from the first surface (100 times the lens’ EFL). The difference in MTF between these two object conjugates is a greater than 5% difference at the mid-spatial frequencies of the system (200 to 800 LP/mm). To determine the minimum object distance required to accurately simulate an infinite object, the percent modulation at 340 LP/mm was calculated for object conjugates ranging from 10 mm to 10 m (Figure 3). For this situation, the MTF reaches a constant value beyond an object distance of about 2 m from the lens. 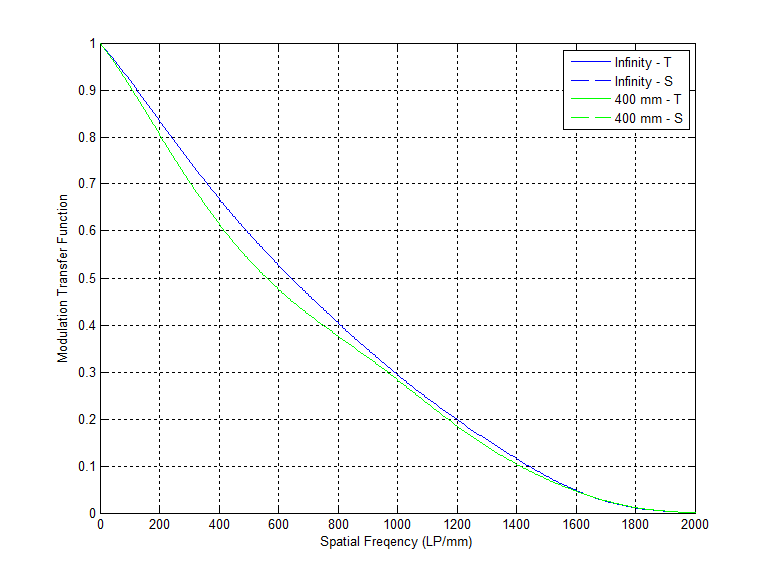 To examine scenario (b) we modeled an f/5, 1:1 relay lens with an effective focal length of 142 mm. The MTF was evaluated on-axis only. 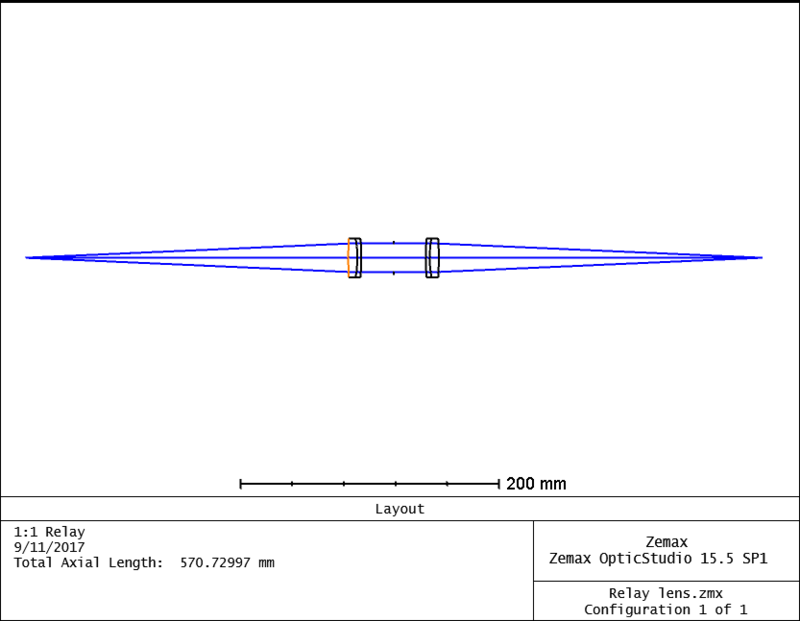 Figure 4 shows the layout of this lens design and the MTF with object conjugates at infinity and at 250 mm is shown in Figure 5. In this case, the discrepancy between finite and infinite conjugate MTF measurements is even more pronounced. 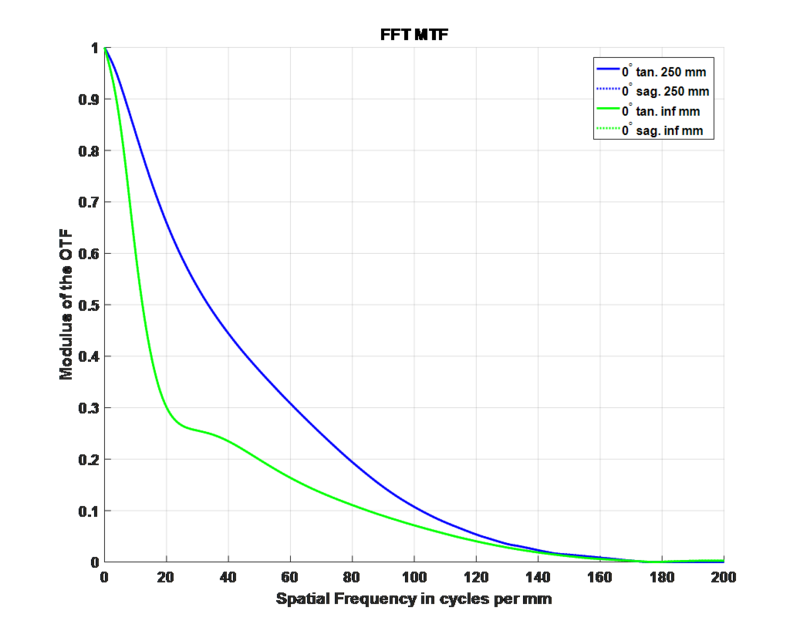 In fact, one could mistakenly conclude that this lens was underperforming based on the infinite conjugate data. Overall, it is important to consider the conjugates for which your system was designed and how it will be used when designing a test configuration. 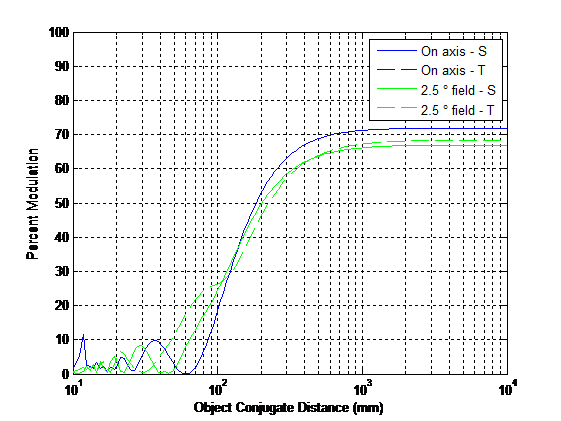 When testing an infinite conjugate system with a finite source, it is important to model the MTF performance to determine an appropriate object distance rather than relying on rules of thumb. At Optikos, we use our infinite conjugate benches to test in these scenarios. For finite conjugate systems, one needs to be aware that testing with an infinite conjugate source is not a replacement for testing at proper conjugates. This is true both when testing lenses alone and when testing full camera systems. 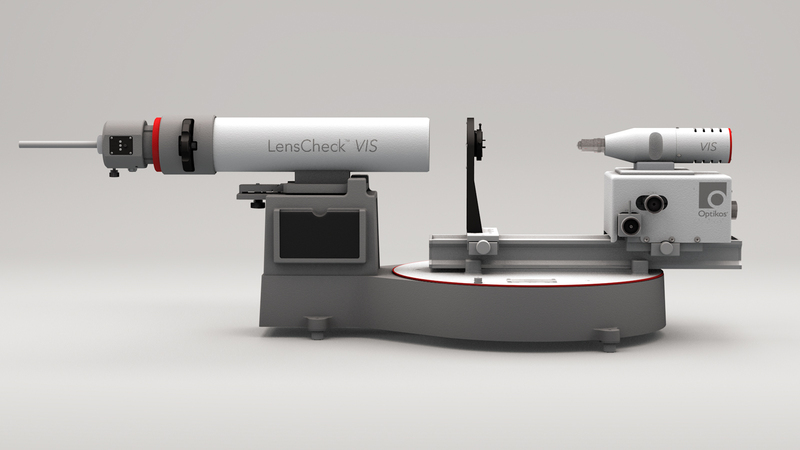 Two powerful systems in Optikos Corporation’s lens testing line are the OpTest® and LensCheck™ systems. 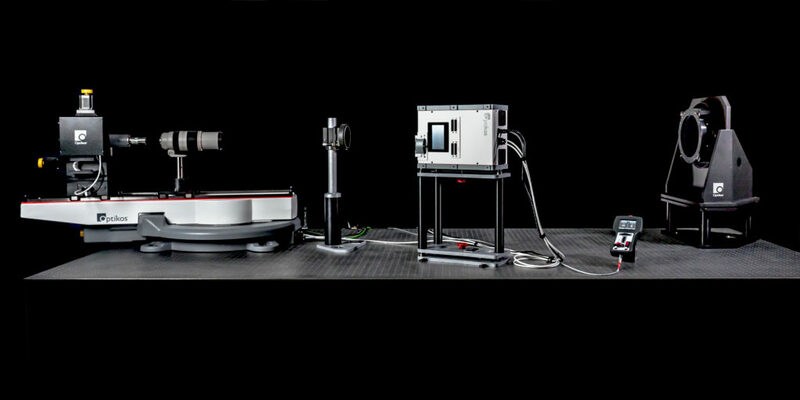 Both systems can be used to measure lens MTF with infinite object conjugates. A standard OpTest bench can be upgraded to perform afocal measurements, suited for rifle scopes, sighting scopes, and other afocal systems. While the data shown is specific to lens systems, proper conjugate testing is relevant to camera MTF or SFR testing. Optikos Corporation provides the I-SITETM system to measure MTF of thermal camera system. 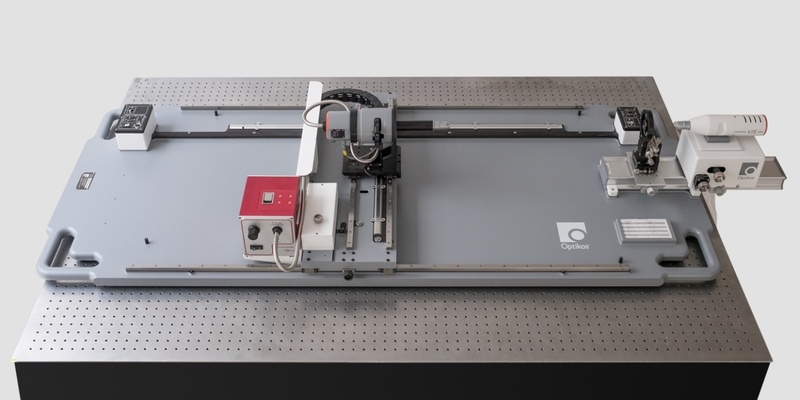 There are variants of both the OpTest® and LensCheckTM systems (Figure 8 and Figure 9) that are for users who need finite conjugate test platforms. These systems feature translatable sources that allow for variation in the required object conjugate distance. The Meridian Starfield Camera Testing System (10) is specifically designed to test cameras with target generators designed for either fixed or adjustable object distances. The Meridian Focusing Target Projector (FTP) allows for camera testing with flexible object distances (Figure 11). 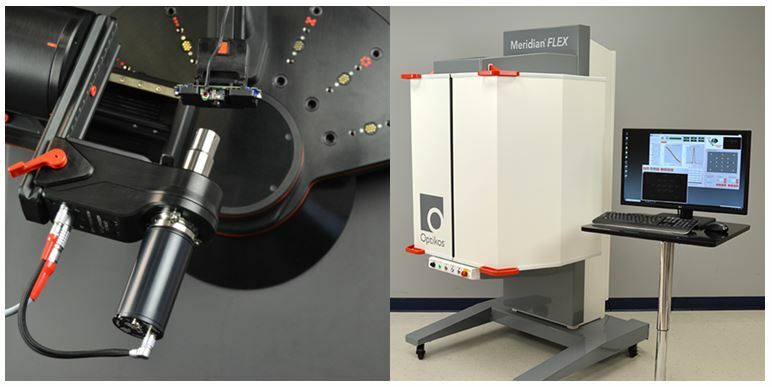 When the FTP is coupled with the Meridian® FLEX Camera Testing Platform, a fully configurable camera testing station is achievable. Optikos Corporation also has extensive experience in custom measurements systems. 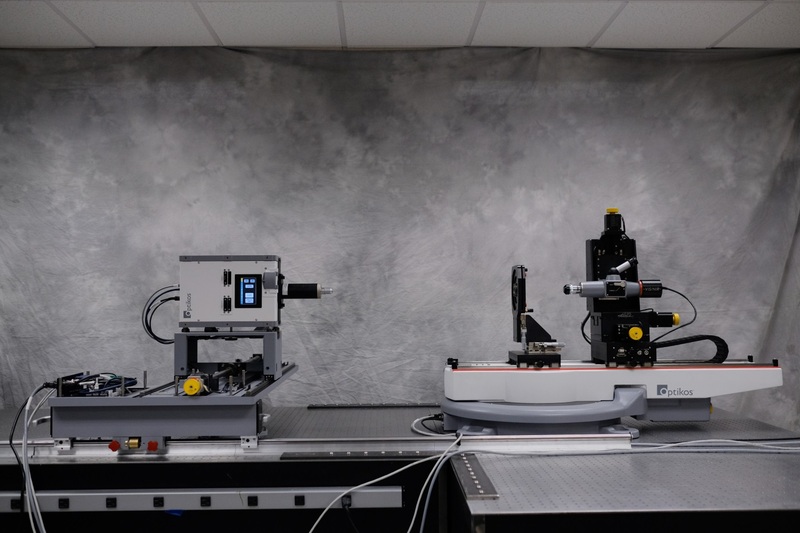 For example, Optikos has developed multiple endoscope testing platforms (Figure 12) for MTF measurement at finite conjugates of complete endoscope systems. Optikos regularly customizes their existing product line to meet the requirements of customer’s specific test station requirements. One LensCheck system variant includes an adjustable conjugate system (Figure 9) that enables the user to perform automated testing of multiple object conjugates.